Non Stanford will compete in her first race next month since winning the World triathlon title in September 2013. The Welsh athlete will race in the International Triathlon Union World Series race in Yokohama on 16 May, after 20 months out with injuries. It will mark the start of 26-year-old's road to the 2016 Rio Olympics and Stanford admits she's anxious. "I'm excited and very grateful to be getting back on the start line ... but I am scared," she said. "I've been out a long time, and I guess [I have] apprehension about have I forgotten how to swim in open water; what if I forget what to do in transition? "I'm hopeful it's going to be a bit like driving and it all comes automatically back to me. "But I think I'd be lying if I said there wasn't any anxiety over it, but once the start gun goes and you get involved I'm sure it'll just get on with it and I'll be fine." Stanford suffered a foot injury in the autumn of 2013, and was preparing to represent Wales at the 2014 Commonwealth Games when a stress fracture ruled her out of that event. Fellow Welsh former world champion Helen Jenkins returns to action in the ITU event in Cape Town on Saturday after 10-months out with injury. Stanford rose to prominence in 2013 when she became the first woman to win the Under-23 and senior world titles in consecutive seasons. But she suffered a series of injury set-backs after winning the ITU grand final in September 2013. The Swansea-raised athlete admits there were dark times during her long lay-off. "There were two I remember," she said. "I was due to fly out to compete in Auckland and instead I was on crutches and in a boot and had to wave them off and came back into a quiet house and just sat on the sofa and had a bit of a cry because I realised I was going to be on my own for a month. 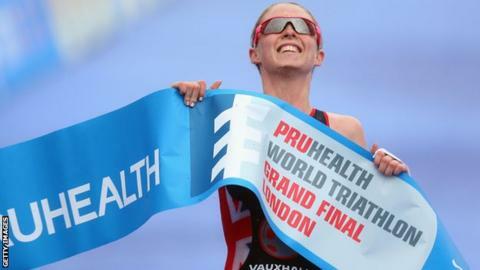 Wales has produced three women's world triathlon champions. Leanda Cave claimed the title in 2002, followed by Helen Jenkins in 2008 and 2011 before Non Stanford completed a Welsh hat-trick at her first attempt in 2013. "The other one was in the build up to the Commonwealth Games and I picked up a stress fracture and facing the media - especially the Welsh media - and during a live radio interview I started crying because I just felt like I'd left everyone down. "There'd been a lot of hype about it being the first medal event and hopefully bringing a medal back home for Wales and that was something I'd really wanted to do and all of a sudden I couldn't do it. "Those were two low points, but it's not all doom and gloom and I'm sat here and I'm smiling now and I've come out the other end of it fine." Stanford is now focused on qualifying for the Rio Olympics. Great Britain Olympic team selection is set for August and September this year. "The whole season revolves around doing well in those two races and everything else is a bonus and secondary. I'm Just focussing on going to the Olympics," she said.